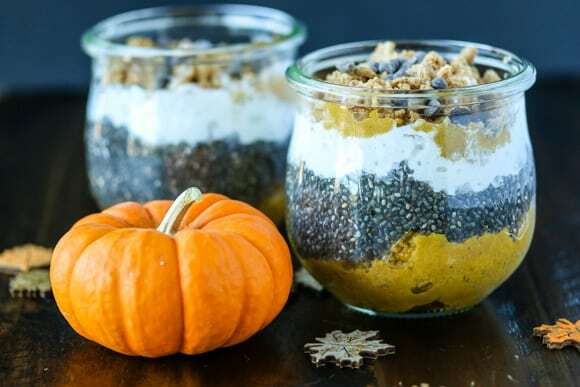 In anticipation of all the Thanksgiving leftovers, here’s a Pumpkin Pie Chia Pudding recipe for a unique way to use your pumpkin pie for breakfast! It’s funny because a lot of people get more excited about the leftovers than the main event. I probably fall into that category, too. I love the idea of raiding the fridge to enjoy my favorite flavors for at least several days afterwards. 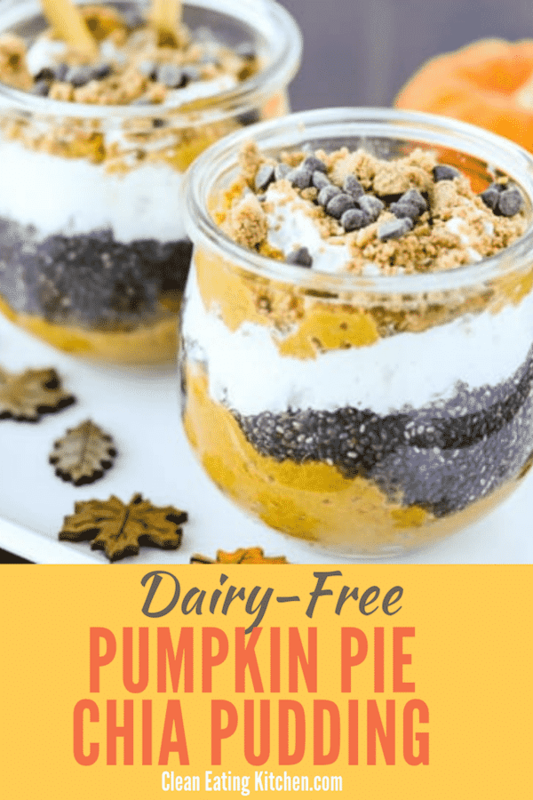 With this recipe, I used the filling and not the crust of the pumpkin pie, which would work perfectly if you make my Crustless Dairy-Free Pumpkin Pie Pudding! 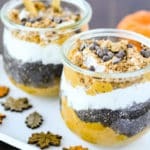 In addition to using leftover pumpkin pie for this recipe, the other layers are simple, just using coconut yogurt (or your favorite dairy-free yogurt) and chia pudding. Heck, if you’ve feeling spunky, go ahead and use some of that leftover whipped cream or homemade coconut whipped cream. I used a Bulletproof Vanilla Shortbread Collagen Bar for the topping, along with a sprinkle of dairy-free mini chocolate chips. 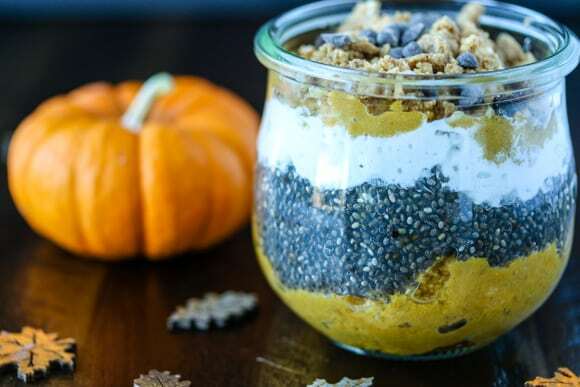 A fun way to use your pumpkin pie leftovers in a healthy breakfast. To make the parfaits, choose two pretty glasses so you can see the layers. Use a spoon to divide the pumpkin pie into the glasses. Then, add a layer of yogurt, followed by a layer of chia seed pudding. Repeat the layers until you use all the ingredients. Top with the shortbread crumbles and a sprinkle of chocolate chips (optional). If you don’t have a Bulletproof bar, you can leave off the topping or crumble a bit of your pumpkin pie crust on top instead. What are you the most excited about making or eating for Thanksgiving this year? Let me know in the comments. 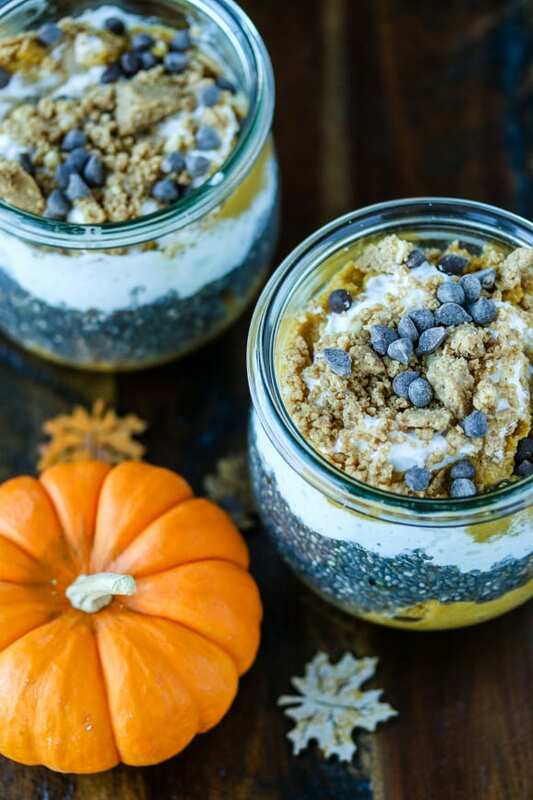 And, be sure to Pin this Pumpkin Pie Chia Pudding recipe to your favorite Pinterest board! This is such a fun snack for the season! 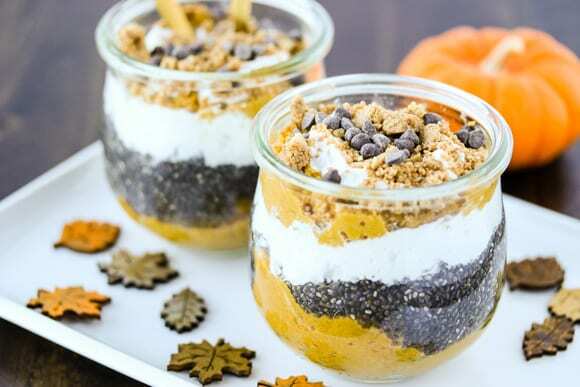 Parfaits are always fun, but I especially love these fall flavors. So yummy. These look too cute not to try!! These are super fun! My girls will love them! What a fun and healthy treat for Thanksgiving dinner. This sounds so delicious! I love the idea of using crumbled pie crust instead of granola on top. The shortbread collagen bar and chocolate chips on top definitely put this over the top. SOOO pretty and yummy!!! Love those gorgeous layers! And that topping looks amazing. These parfaits are so PRETTY! Love all things pumpkin pie right now!